Chris Tse and Emily Writes are thick as thieves. One look at them, and you see a pair of talented friends who are committed to their literary pursuits, separately and together. What makes the pair stand out isn’t just their talent, but the fact that they are so dedicated to supporting one another and being cheerleaders, for literature, Wellington and the others dreams. I first met Emily at the Gala in 2017 for the New Zealand Film Festival, already a big fan-girl. I had already met Chris at the Wellington on a Plate event I attended at Hippopotamus in 2016 (who was super nice, and impeccably dressed), and seeing them together, it was beyond my level of coolness not to ask Chris to ask Emily for me whether it was okay if we had a photo together. I was SO chuffed when she said yes. 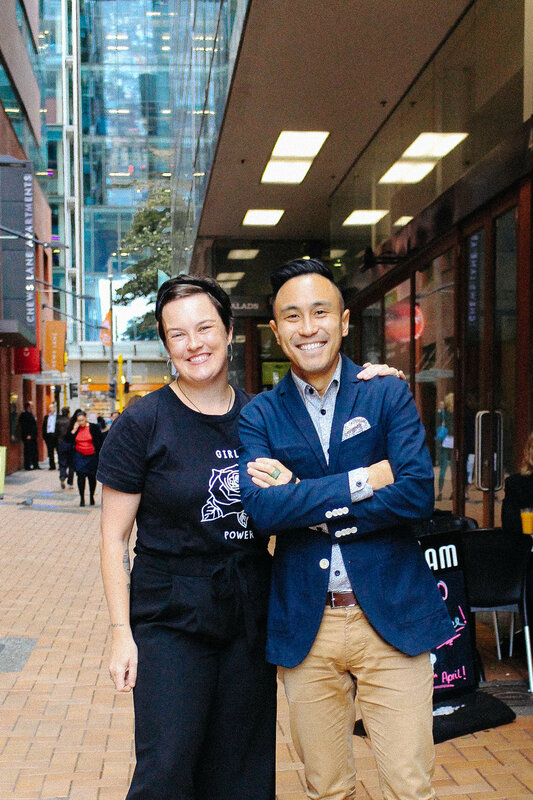 Even more exciting, I found myself working in parallel to Emily on an assignment for a client, and so I plucked up my courage to ask her and Chris to reflect on their friendship, work and the changing face of publishing and media in New Zealand. Who are Chris Tse and Emily Writes? Emily Writes is best known for her work as a blogger, her role as editor for The Spinoff Parents and her book ‘Rants in the Dark’. Her second book ‘Is it bedtime yet?’ is out in August. Chris is a poet and rising literary star. He has been featured on The Spinoff, blogs for Wellington on a Plate, and has had two books published by Auckland University Press: ‘He’s so MASC’ and ‘How to be Dead in a Year of Snakes.’ Both have been featured at literary festivals around the country and in Australia. Chris was born in Lower Hutt. “When I grew up, and before I was born, my whole family worked in food. My parents ran a restaurant, several takeaways and a Chinese grocery store” he explains. “I was always around food as a kid.” His grandmother and his grandfather looked after Chris a lot while his parents ran the restaurant when he was little, leaving him to ‘play’ in the fruit shop. How did Chris and Emily begin their careers as writers? When Chris left high school, with a passion for writing and flare for creativity, he decided to study English literature and film at University. “I did flirt with the idea of doing journalism for a while, but I decided that I didn’t have the gusto for that” says Chris. After completing his degree, he stumbled into a job working in publishing with LexisNexis. “I’ve spent most of my working life in publishing, but recently I made a sideways step into communications,” explains Chris. His day job is now for the Office of the Auditor-General. The friendship grew and their shared literary pursuits have brought them closer as mates. “I’m so proud of Chris for his book ‘How to be Dead in a Year of Snakes’” Emily enthuses. “The best thing now is that I remember when we went to the Wellington Writers Festival and I was saying to Chris that I just wanted to write a book. He really believed in me and told me not to give up. The next week, Penguin called me offering a book deal. It was crazy. He’s my work-wife. We go to literary festivals together and I’m desperate for us to become a double act” Emily laughs.